When the newly organized 100th Infantry Battalion (Separate) disembarked in Oakland, California, in June 1942, virtually all of the troops were newcomers to the mainland. The Hawaiians had grown up in a distant American Territory (two decades before statehood) — a very different country from the one they were now encountering. On the mainland, Japanese Americans were regarded as a threat to national security, even though they were less than one-tenth of 1% of the prewar population — and even though the West Coast was 2,500 miles beyond the reach of Japanese aircraft carriers. 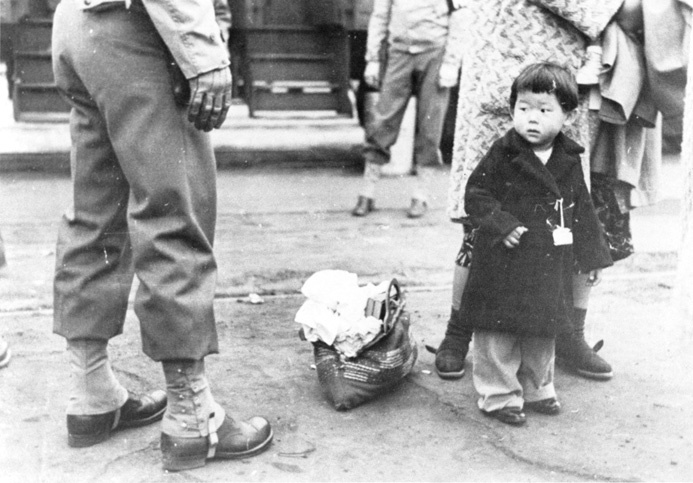 Supposedly to protect the mainland from espionage and sabotage, President Franklin Roosevelt’s Executive Order 9066, issued two months after the attack on Pearl Harbor, authorized the military to remove 110,000 Japanese Americans — most of them native-born citizens — from their homes in California, Oregon, Washington, and parts of Arizona, and to “relocate” them in detention centers, surrounded by barbed wire, in remote regions of the United States. In the Territory of Hawaii, by contrast, Japanese Americans were roughly 37% of the prewar population. But even though Hawaii was the most important American military outpost in the Pacific, and even though the attack on Pearl Harbor had turned the Territory into a real war zone (unlike the West Coast), the commander of the islands, Lieutenant General Delos Emmons, resisted the pressure to put the local Japanese American population in detention camps. In part, his response was pragmatic. 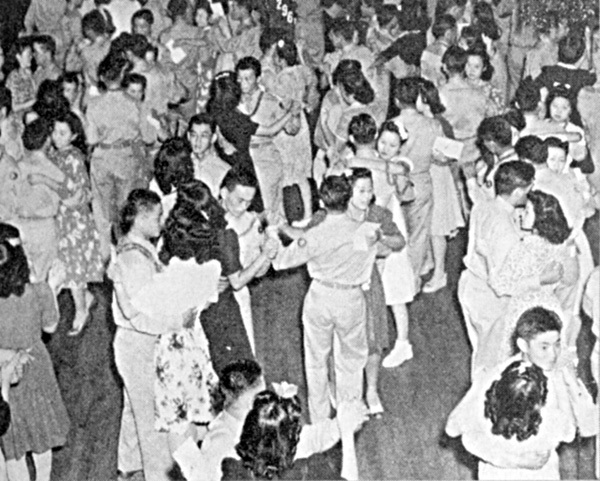 Although most Japanese Americans still belonged to an immigrant culture centered in the sugar and pineapple plantations, their sheer numbers gave them political weight in Hawaii and a vital role in the local economy. They were far more important to the war effort in the islands — not just as field hands but even as civilian workers in the defense industry — than were their counterparts on the mainland, who were proportionately in such small numbers, and so isolated geographically, that they could be made to disappear without too much disruption. And, unlike the bureaucrats in faraway Washington who decided the fate of Japanese Americans on the West Coast, Emmons heeded the advice of locals who actually knew the Japanese American community. Robert Shivers, the FBI’s special agent in charge of the Honolulu office; Colonel Kendall Fielder, head of military intelligence in Hawaii, Charles R. Hemenway, a prominent local businessman, and Hung Wai Ching, a Chinese American civic leader, all advised Emmons to resist pressure from Washington to “relocate” Japanese Americans — even though Emmons had the power to do so under martial law. Emmons did, however, make one significant concession to Washington — an act of segregation that actually wound up benefitting Japanese Americans. On the mainland, Japanese Americans already in the service before Pearl Harbor were scattered among dozens of different units in as many different locations. In the islands, by contrast, more than 1,400 Japanese Americans were serving primarily in just two units, the 298th and 299th Infantry Regiments of the Hawaiian National Guard. So on May 28, 1942, in response to a direct order from General George C. Marshall, Army Chief of Staff, Emmons reorganized the Japanese Americans in these units into a segregated provisional battalion that would be designated the 100th Infantry Battalion (Separate) after it disembarked stateside. The newly christened battalion traveled from Oakland to Camp McCoy, Wisconsin, where the troops spent the second half of 1942 in training. Most of the men saw snow for the first time, and most also experienced their first extended interactions with white Americans, both military and civilian. Whereas the 100th was intended to segregate Japanese Americans already in the Army in Hawaii, the 442d was presented as an opportunity for Japanese Americans on both the mainland and the islands to “exercise the responsibilities of … citizenship” and to prove themselves “loyal American citizens” by volunteering, according to President Roosevelt’s order authorizing formation of the unit on February 1, 1943. But Hawaiians and mainlanders viewed that opportunity quite differently. The War Department had originally set a quota of 1,500 volunteers from the islands, but more than 10,000 Japanese Americans answered the call to service. 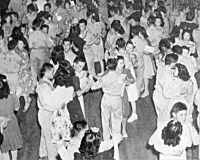 The quota was eventually increased to 2,500, and when the volunteers assembled for transport to the mainland in March 1943, they were hailed by a crowd of 15,000 spectators at an official ceremony at Iolani Palace. So when the islanders and the mainlanders first met in Camp Shelby, their very different cultures and expectations were bound to clash. The Hawaiians, products of the plantation system, enjoyed a sense of group solidarity — even, as the largest minority group in the islands, a sense of ethnic superiority. The mainlanders, by contrast, were used to life as a tiny and — after the “relocation” — legally oppressed minority. The islanders also dressed, spoke and acted very differently from their stateside counterparts. Hawaiians saw themselves as outgoing, generous, and “happy go lucky,” and regarded the mainlanders as aloof, cheap, and affected. For their part, the mainlanders saw the Hawaiians as clannish, ill mannered, and uneducated. Unlike the islanders, who had been showered with large monetary gifts when they left Honolulu, the mainlanders were saving every penny for their families in the detention camps. And, mostly raised and educated as isolated minorities in communities dominated by Caucasians, the relatively more assimilated statesiders literally could not understand the islanders’ rapid-fire pidgin, the common parlance of the plantation camps. Fueling the conflict was the presence of statesiders in key positions in the original cadre of the 442d. Prior to the new recruits’ arrival at Camp Shelby, non-commissioned slots that the Hawaiians thought they had earned by virtue of ROTC training had already been filled by Japanese American soldiers who had been serving as non-coms in non-segregated units stateside. Eventually the tensions between kotonks and Buddhaheads began to abate when Col. Charles W. Pence, commander of the 442d, arranged for groups of soldiers to visit the Rohwer and Jerome “relocation centers,” 250 miles away in Arkansas (and, later, for civilian detainees in the camps to visit Camp Shelby). Their hosts in the camps had set aside their rations and invited the soldiers to stay with families in the barracks. But “we said no,” Inouye recalled. “We tried our best to be happy,” and instead slept in the trucks from Camp Shelby, in the mess halls, even outdoors. On the way home, “the mood on the trucks was different. No one sang. There was no conversation, not a word, just quiet,” Inouye remembered. It was all mind boggling…. The thing that went through my mind constantly was: “I wonder what I would have done. Would I have volunteered?” We [Hawaiians] volunteered from a community that was generous. We weren’t herded away. But these guys were herded into camps like this, and they volunteered. The visits to the camps helped the mainlanders and the islanders overcome their differences through a shared understanding of their responsibilities not just as Japanese Americans but as American soldiers. By segregating Japanese Americans in the 100th and the 442d, the Army had unwittingly created what amounted to elite fighting units. Most of them were volunteers, older and better educated than the average troops, and they were highly qualified (with even the most qualified serving as riflemen because they had been barred from transferring to specialized units elsewhere in the service). As a result the two Japanese American units were less like regular infantry outfits and more like the newly formed Rangers, modeled after the British Commandos. By that time, the 100th had earned a new nickname because of the heavy casualties it had already suffered in Italy: the “Purple Heart Battalion.” The unit, originally 1,400 strong, had been reduced to 663 effectives. In April 1944, replacements for the 100th Battalion started arriving from Camp Shelby, drawn from the 1st Battalion of the 442d. Just as the mainlanders and Hawaiians had come together at Camp Shelby, the two units of Japanese American soldiers were becoming one, joined together as American soldiers fighting for their country — in which they expected to play a free and equal role as fully responsible citizens. Robert Asahina is an editor, writer, and consultant. He is the author of Just Americans: How Japanese Americans Won a War at Home and Abroad — The Story of the 100th Battalion/442d Regimental Combat Team in World War II, published by Gotham Books/Penguin in 2006.